Penrith Harmony welcomes men of all ages to join. If you are not familiar with barbershop style singing just visit us on rehearsal night to discover for yourself. If you are a beginner, we would love to help you learn. It is great fun to harmonise without instruments support. We have a simple audition in which you learn to harmonise two simple songs. Whether you're a singer of great experience or have had no formal musical training, if you love to sing and you have the aptitude and the passion, then you're invited to join us for a rehearsal and audition to become a member of Penrith Harmony. We're currently looking for new voices to add to our ensemble, so if you've ever considered joining a dynamic a cappella choir or chorus and you have an interest in learning to become a better singer and performer, then now is the perfect time to fulfill your musical dreams and come sing with us! By joining, you will become part of a national and international community. 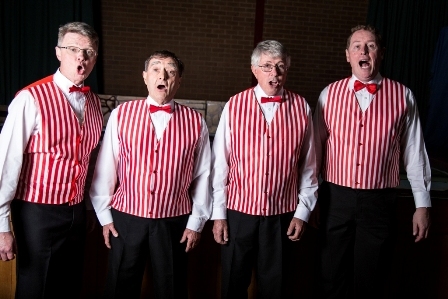 There are approx 1000 male barbershop singers in Australia and over 35000 members worldwide, with networks and resources to support every endeavour. You’ll have fun and make lifelong friends. You will also receive high level vocal coaching which you will benefit from in any style of singing you wish to undertake. Singing without musical instruments is the purest form of music. It also lets the singer finely tune the chords for the best possible sound. Singing in the car, singing in the shower, singing in the shed… Come on out into the open. Go on, you know you want to!